Mydax offers extensive Technical Support for our products. If a live contact is needed to help with any question or problem, please call us from 8:00 am to 4:30 pm Pacific time, Monday through Friday. Mydax products are typically sold with a standard “back-to-factory” parts and labor warranty. If problems arise with a Mydax system, technical support is always available. Usually phone or email conversations can help the system operator with questions that they have. All Mydax system’s have extensive built in diagnostic capabilities to help pinpoint any issues that may be a concern. Our free remote data collecting program can be used and the data sent to Mydax for evaluation and troubleshooting. In many locations, both domestic and internationally, Mydax can dispatch an independent service organization already familiar with Mydax systems. If you already have a service organization that you are comfortable with, Mydax is willing to work with them to provide the level of service you need. 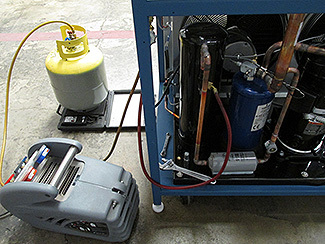 Mydax offers a training course to acquaint you or your service staff with your new chiller. Classes are available in 1, 2, or 3 day sessions. Contact our service department for more details at service@mydax.com.